A bulky volume is this first Soncino edition; found entire only when pieced together from stray fragments and pages by the care and knowledge of the booklover. It seems especially to have aroused the ire of the Inquisitors, for its destruction is almost complete; of the copies extant all bear traces of the hand of its foes, and torn pages still further defaced by the ink scrawl of the censors are eloquent in their silence. The Library has a fine copy of Volume 2, the first Hebrew book printed in Cassalmaggiore. The censor's blotting out of words and phrases throughout the volume does not deface it; it adds a silent majesty to it, particularly so because the censor's ink has faded, while the printed letters he sought to erase endure in all their clarity. This Roman rite prayer book, printed by Joshua Solomon Soncino in 1486, is one of the earliest published. Volume 2, containing the prayer for the High Holy Days, Rosh Hashanah (the New Year) and Yom Kippur (the Day of Atonement), is open to a penitential prayer in the fifth and final service of the Day of Atonement, Ne'ilah (the closing of the gates). It begins: "Thou stretcheth forth thy hand to the sinner, and thy right hand is open to receive the repentant." It is the only prayer printed in large type throughout. Could this have been done with Marro nos in mind, those who had been forcibly converted but retained loyalty to the ancestral faith? Mahzor Minhag Roma (A Prayer Book of the Roman Rite), Casalmaggiore, 1486. Rare Book and Special Collections Division. Thou desirest the repentance of the wicked and not their death, as it is written: "Have I any desire, says the Lord, for the death of the wicked man? Would I not rather that he should mend his ways and live?" Praise be to God who has not withheld his Mercy from us. His left hand casts us off, but His right brings us nearer to him. So may He, in His mercies, sustain our souls and grant us life among those who do His will. This book was completed in the city of Rimini, which is under the dominion of Pope Leo X, may his glory be exalted, this 21st of March, corresponding to Nisan 13. Praise to the Lord, to whom blessing is due, and glory to His great Name. Leo X was the most benevolent of pontiffs, whose reign was a happy one for the Jews. He permitted Elijah Levita to establish a Hebrew press in Rome, and Daniel Bomberg to print the Talmud. His benevolent attitude influenced the Ecclesiastical Council of Rimini to permit Gershom Soncino to establish a Hebrew press in that city, and Soncino is grateful for it. Gershom Soncino, greatest of early Hebrew printer issued a comprehensive prayer book marked by excellence of typography, page design and ornamentation, as was his wont. In his colophon, he notes that the city of Rimini, where he had set up his press, "is under the dominion of Pope Leo X," the benevolent Pope who permitted Elijah Levita to set up a press in Rome. Open to the service for Tisha B'Av (Ninth Day of Ab), the Fast Day commentary on the destruction of the Temple. Note the ornamentation surrounding the first word of the Book of Lamentations read that day. Mahzor, Rimini, 1521. Hebraic Section. Pius codified, reinforced, and intensified the whole of former, degrading anti-Jewish legislation, however barbarous it was, and went so far as to forbid Jews from passing the night outside the ghetto, under the pain of death. [I] did not invent anything, but gathered from existing authors ... as the gleaner follows the harvester ... I did not seek to produce fine flour, but flour made from roasted ears [in Aramaic Kimha de-Avishuna, the title of the work]. The Library of Congress copy was formerly in the Great Synagogue of Ferrara, as is indicated in manuscript on the ornate title page, and also noted on the first page. Volume 1 of the Bologna, 1540 edition of the Roman Rite Mahzor (Festival Prayer Book) contains the commentaries of Maimonides and Ovadiah Sforno. On the title page, the letters bet, heh, and kof written in the blank square at the top, are the initials of Bet Ha-Kenesset (the Synagogue); on the square below, "Ferrara." At the bottom of the printed words, the manuscript notation in large letters, "B'kehilla Kedosha Ferrara" (in the Holy Community Ferrara). On the page following, it states that this volume was bought by the Great Synagogue of Ferrara..
Mahzor Romi (Roman Rite Festival Prayer Book), Bologna, 1540. Hebraic Section. 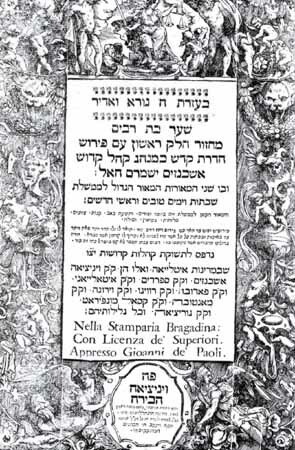 An even larger, grander edition of the Ashkenazi mahzor, containing the liturgy for "the Sabbath, the Holidays, the New Month as well as for Purim, Tisha B'Av ... the wedding ceremony and circumcision," was published in three large volumes in Venice in 1711. Its title page is ornate, in the grand Italian style. Its publishers, Joseph and Jacob Hai Cohen, announce that their prayer book is published for the congregations in Venice: the Ashkenazi, the Sefardi and the Italian; as well as for those of Padua, Rovigo, Verona, Mantua and Casale Monferrato, Gorizia, and their environs. The special authorizations are printed in very large letters on the first two pages; that of the Padua authorities stipulates that as many copies as were published in 1600 may now be published, and the other grants a copyright for twelve years. Approbation by leading rabbis affirms the twelve-year period during which no other editions may be published. The publishers had spent a huge sum of money for so grand a publication and wanted to protect their investment. The Library's copy, bound in parchment, is in such pristine condition that either it was handled with the greatest reverence or was little used. This majestic pulpit prayer book containing all the prayers for all the services of the entire year was published in three volumes in Venice, to fulfill the needs of all the Italian Jewish communities and all the variety of rites. The publishers, having received the approbation of the Venice rabbinate, traveled from city to city seeking subscriptions and soliciting the financial aid of the wealthy "for the expenditure is great." To protect the rights of the publishers, the rabbinate forbade the publication of any other edition for twelve years. 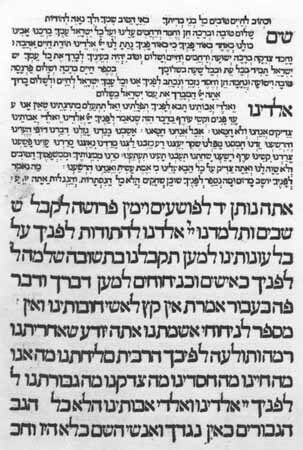 Mahzor, Sha'ar Bat Rabim, Venice, 1711. Hebraic Section.